The Japanese automaker Lexus is introducing the world’s first digital side-view monitors. The automaker announced that these advanced, futuristic camera-based devices will debut on new Lexus ES models. The new digital side-view monitors will replace the traditional side-view mirrors on the new ES when it launches in Japan next month. Digital side-view monitors offer drivers improved views of the left, right, and rear of the car. 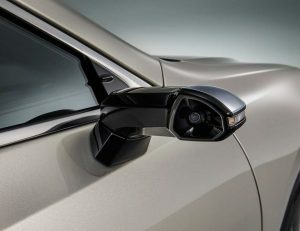 The system consists of a pair of side cameras known as Digital Outer Mirrors, which are mounted on stanchions where the car’s side mirrors would normally reside. What the cameras see is shown on a pair of small screens, which are angled toward the driver. Lexus boasts of the camera housings, which have been specially designed to curb rain and snow accumulation that could obstruct camera vision. It comes with features like blind spot warning, object identification, and also a green light that tells the driver when it is OK to merge into traffic. Once the turn signals are activated, or the transmission is put into reverse, the system automatically enhances the corresponding area: left, right, or behind. One can even manually enhance the view of areas around the car to obtain complete peripheral awareness of the area around the vehicle. These new monitors are no doubt digital marvels. If you are interested in this tech, and you are outside of Japan, then you’ll have to wait for a while to get them. The digital side-view monitors will only be made available in Japan for now.